I need a large graveyard for an upcoming game titled “Grave Consequences.” The plot is kinda lifted from "The Good, the Bad, and the Ugly." Some famous owlhoot robbed a shipment of Union Army gold and had it buried with him in his coffin on Boot Hill. Two gangs arrive at the same time in the middle of the night to claim the treasure as their own. After I’ve playtested the game a few times, I will be writing it up and posting it as a free adventure in the Downloads section. 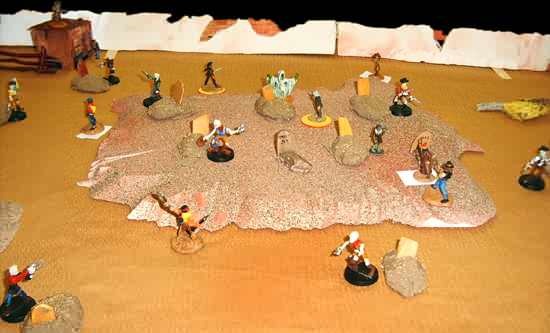 Aside from wanting the table to look nice, there are several gaming considerations that need to be met. 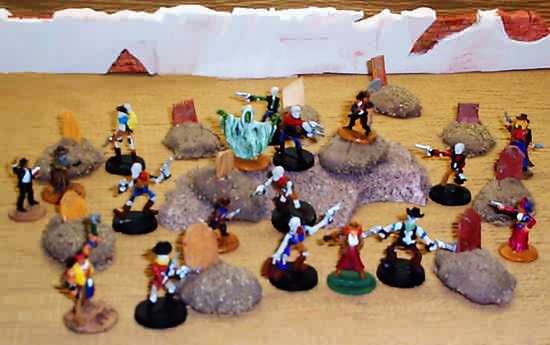 I need a large graveyard with lots of little tombstones to provide cover and hiding places, and they need to be spaced out enough to allow my large-based miniatures to move about freely. I’d like one big hill, preferably flat enough for the miniatures to rest on it without falling down. When finished, it must fit in one of my standard game shipping boxes, which will comfortably hold something that is 12 x 18 inches. It also needs to be transportable and sturdy (I want this to last for a few years, at least). I was on a time crunch for this particularly layout, but all in all I’m very pleased with how it turned out. I’ll add some more detail to flesh it out in the future (more shrubs, graves, and some smaller hills and mounds to make it look interesting). But, as a battlefield for a game, it came out very nicely. For my primary building material, I’ve settled on Extruded Polystyrene, better known as pink insulation foam. I chose this because its light, durable, and I wanted to play with my new Woodland Scenics foam hot wire cutter. It’s very easy to find the pink insulation sheets (they are also available in blue) at Home Depot or Builders Square. I paid about $10.95 per sheet (4 x 8 foot sheet and a half-inch thick) and bought two of them, which is a LOT more than I’ll need for this project. 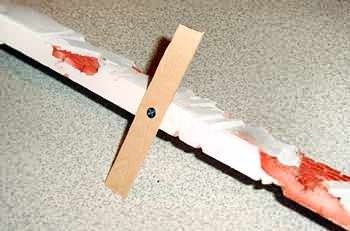 I had to use my pocket knife to slice them into strips thin enough to fit into my car. This was easy to do, though, and only took a few minutes. Plus, it made it a lot easier to handle and store them at home. 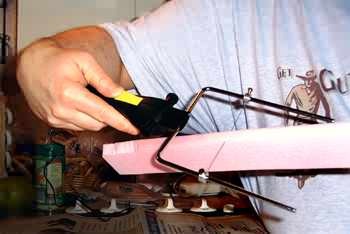 I will also be using wood, Elmer's White Glue, floral wire (to reenforce some of the styrene, and a Woodland Scenics hot wire foam cutter. I wasn't sure how big I wanted the final game area to be, so I made more wall segments than I would need. This was my first experience using the hot wire foam cutter, and I must say I was VERY impressed with it. I adjusted the wire so that it was 2 inches from the base, and that allowed me to use it as a guide so I could cut 2-inch strips of foam. The cuts were fast and remarkably straight. After I had 10 segments (20 x 2 x 0.5 inches) cut, I used the cutter to sculpt some variations along the top of the walls. I just cut random shapes and edges o provide a little variety to each wall. Since I was going for a look of worn adobe or stucco, any sort of variation would be okay. I had originally intended to create a small brick pattern over the entire surface of the wall. I tried using a pencil, a blunt knife, and even the backside of a paintbrush. I tested this look on three panels, and it looked horrible. No matter what I did, it wound up looking like a castle wall, not an adobe-style wall suitable for an Old West graveyard. I worked in the kitchen under the exhaust vent for this stage of the project. Even though it's stronger than most fans, I did have to hold the cutter and foam directly under it in order to keep the odor under control. Finally, I decided to attempt the “less is more” approach, and tried carving out small sections of bricks into the wall, as though there were an outer layer of stucco and it had chipped away to reveal an inner wall of bricks. To make the brick patterns, I used a razor utility knife to define the area where the "stucco" is chipped away. 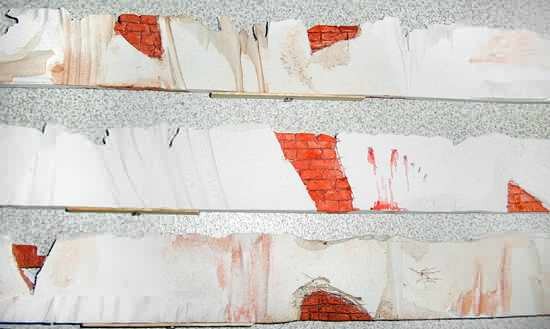 I carefully peeled off a thin surface layer and then, after smoothing it out a bit, I would cut thin rows of bricks. I would then cut the vertical slices to make them look more like bricks. I quickly adopted this as the look for the walls and started carving small brick patches here and there (usually only two or three per side), and I also began roughing up the rest of the wall to make some irregular features to give it character, and to provide some nooks and crannies for the paint/wash to settle into during the final painting stage. 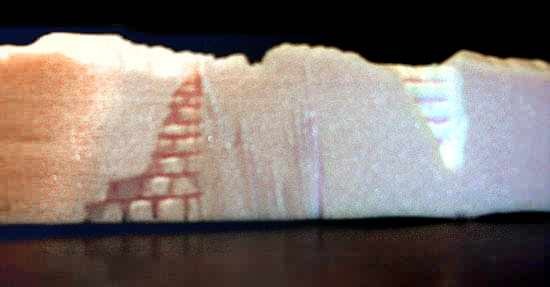 Once I had the basic brick pattern cut into the foam, I would expand the slices (where were very thin and almost invisible to the naked eye) by pushing a blunt object through the slices. I used a Sculpy modeling tool and, later, a pair of blunt tweezers. I could have used almost anything at this point, really, as long as it was blunt and firm. Now that I had them carved, I found that painting them was more of a problem than I had anticipated. I used some scrap foam to test the effects of spraying Krylon acrylic primer and paint on the foam. It ate it up. It didn’t exactly eat holes in it, but it did dissolve the edges and leave nasty pockmarks all over the surface. It wasn’t attractive at all (and it wasn’t even usable on rough terrain). Next I tried just painting it with white acrylic paint (just the Folk Art brand I had picked up at Hobby Lobby) but it took too much paint and took too long. I was getting into a time crunch, so I called out for help on The Miniatures Page and, sure enough, the guys there came through with a suggestion that did work. Krylon H2O spray latex paint. I found it at Wal-Mart for about $3.77 a can (I bought white primer and a light tan paint). Oddly enough, there was something wrong with the tan paint. No matter how hard I shook it, the durn stuff wouldn’t mix properly. In fact, it shot out of the can like silly string. No kidding – it shot a west plasticy string across the yard. My wife speculates that I might be old and have “gone bad.” I suspect she’s right. Fortunately, the white primer worked fine. There were no adverse effects to the Styrene. The day I was spraying was a bit chilly and damp, so it took MUCH longer than the “15-minute dry time” advertised on the can. I left it outside in the garage for a few hours and, after the fumes had mostly dissipated, I brought it into the house to dry overnight. I would like to add that this paint doesn’t cover quite as well as acrylic, and I had to do a lot more shaking than usual to keep the nozzle from getting gummy. All in all, I would say it’s a slightly more difficult paint to work with, but in this case it was definitely the best solution for this job. As a fun detail on the middle wall, during the sculpting phase I used an Xacto blade to cut some tiny bullet holes, and then I touched them up with a few blood stains when I painted them. After all, what’s a stucco wall without past evidence of a firing squad? Now that I had the walls Primered a nice coat of white, it was time to add some detail. The most dramatic detail was, of course, the red and brown bricks. The moment I added those colors, the walls suddenly “came to life” for me. I found the trick here was to go with a loose synthetic brush and slightly watered paint and just glop it on in heavy coats. I then used a smaller brush for the edges that butted against the white stucco of the walls. The final touch, for now at least, was to add some stain and a little wash (made of Future Floor Polish, water, and paint). For this, I used a damp paper towel and just splotched it on where it would look good and bring out the details. In the future, I plan to add some flocking and a few other details to make them look more realistic. One bit of advice: flat surfaces are not your friends. Flat walls tend to look new and fresh, which is not really the mood you want to convey in a horror game. Roughen things up a bit is a very good practice for a project like this. The results were very good and i even had a few people ask me where I bought these walls, as they would like to get some for their games. They were quite surprised when I told them how I made them. Now that I had the walls ready (at least enough for the game), I needed to find a way to make them stand up. Even though they would stay up on their own on a still, flat table (they are a half-inch thick, after all) I had no confidence that they would stay upright during the rigors of a game. I had originally toyed with the idea of making posts or even sculpting foam pillars and gates to support them, but I was running low on time. I then considered just poking wire into them to hold them together. Once they were in a square shape, they would support each other. But I didn’t like the potentially destructive nature of this approach – over time it would mess up the ends and make them structurally unsound. One added bonus to this type of base is that it was very easy to set up for the game. I just took the segments out of my travel box, pivoted the wooden bases, and set them into place. I was very pleased with the speed with which I set up everything. Finally, my wife suggested a simple and elegant solution: just put thin slats of wood on the bases, the same width as the wall, and use a nail to let them pivot in place. At first, from her description, I had trouble understanding what she meant, but a simple demonstration (and, in your case, a glance at the photos) made it clear that this was a very workable solution. I wound up replacing the nail with a thin wood screw. It gives better traction in the foam and, as long as you’re gentle while turning the wood, it seems to be doing a great job of gripping the foam. As you can see, the walls are so light that each one only needs a single support base. They still need some more detailing, but in general I'm very pleased with the way they came out. The graves were definitely an interesting part of this project. 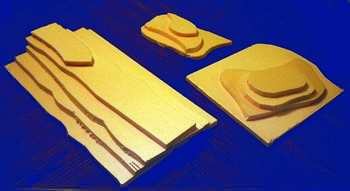 I considered several approaches, including styrene, Sculpy, and modeling clay. After my experiences cutting the styrene, I decided that the graves would look to sharp and angular if I went that route, so I opted for something cheap and very organic: spackle. Spackle is a putty-like goop that’s used to texture and repair holes in drywall. I decided to try using a pre-mixed spackle that I had picked up at Sears Hardware. I had previously used it for basing miniatures, and frankly wasn’t that impressed with the results because it stayed flakey after it dried. 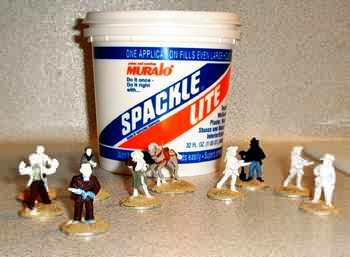 I had picked up some Muralo Spackle previously and even though I didn't really like the way it worked for basing miniatures, I decided to give it another try. One of the advantages to using Spackle is that it’s white and you can mix paint in it to add color. Frankly, I was surprised by the amount of Spackle that it took to make a really dark, muddy color. Fortunately, I was using cheap hobby paint and not expensive Vallejo paints, so it didn’t really matter. Also, in order to get it to mix properly (some of it had turned a bit crusty and needed to be broken up), I had to add some water. The combination of paint and water made it very runny and very messy (good thing I wore latex gloves while working on it). Fortunately, during the final phase I decided to add some railroad talc (just small stones that are used in model trains to lay beds for train tracks) to the mix and this really helped soak up some of the moisture. With my wife's help ("It's just like making cookies," she said), we plopped little globs of spackle onto parchment paper and set the oven to 250 F degrees. I shoved small wooden tombstones into the little mounds and then we baded them for about 30 minutes. 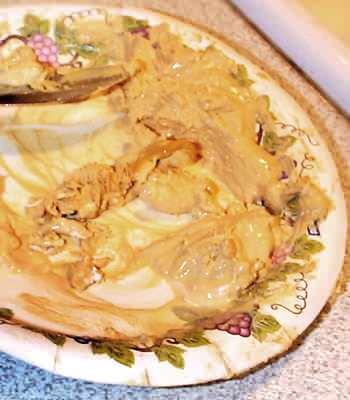 Spackle, paint, and water made for a sticky, gooey mess on the paper plate I was using as a mixing palette.It took a lot of paint to achieve the dark muddy brown I wanted (this shot is from an intermediary step where it was still golden brown). My wife was right -- like cookies, the little graves puffed up. The consistency was quite surprising: they were VERY light and airy feeling, yet maintained a certain hardness to them. They were firm and solid, but very light. The paint, talc, and puffiness were a great combination, but alas, there isa serious drawback. While baking the graves, they STANK. I mean there was a strong, vile odor that did not entirely fade for weeks. Oh, the house cleared up within the hour, but the graves themselves had a distinctive, unpleasant ordor for months. It has finally gone away, but a smell that persistent tells me this was probably not my best idea. So far I've focused on the walls, but I'll start a write up on the Hills, soon. Nevertheless, as you can see, I just glued some rough shapes together to serve as a guide for the height of the three hills I'm working on. I used watered down Elmer's Glue, and was very happy with the results. It seems to be holding well, and it didn't cause any problems while I was cutting it with the hot wire foam cutter. I exagerated the colors on this photo because it helped bring out the detail of the base shapes. It turns out these were too tall for this adventure -- they just didn't blend well into a cemetary setting. I wound up scrapping this direction and, instead, made a small, flat hill only a half-inch tall. This worked MUCH better for this particular game. HILLS, WALLS, AND ZOMBIES... OH MY! When all is said and done, everything came together in time for the big game at Little Wars. The players had a grand time, and that's what counts. I'll post more photos and links to the battle report soon. For texture on the hill, I used a base coat of Krylon H20 Latex Primer (regular acrylic primer will disolve and "eat" the Styrofoam). After it dried, I added some basic brown/rust-colored auto primer (probably Wal-Mart brand). Now that I had a good base coat in place, I sprayed the hill with a stone finish paint. It's a bit expensive (about $6-$7 a can), but it really delivers great results. When it comes to cowboy zombies, there really aren’t a lot of choices. Foundry makes a set, but that’s about it. There are plenty of generic zombies out there, but I really didn’t want to do any conversions (adding hats and such). My personal preference is to buy things “off the shelf,” so to speak, so other people can buy the same items to run in their games. For these early games, I decided to buy a set of Shockforce Dead Tech zombies. These were for a sci-fi game and had lots of little cybernetic doohickeys on them. I did wind up filing off a few of these bits and just painting over others. All in all, not too bad. However, keep in mind that these figures are rather large compared to the other figures – see below for comparison shots. In general, these figures were okay, but I can’t really see myself endorsing them unless you don’t mind the conversion work and scale issue (a few people said they liked having them bigger because it made them seem more intimidating on the table). 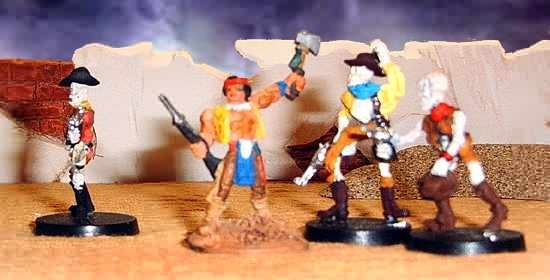 The Indian is a Deadlands figure on a tall base. He seems to blend okay with these figures (since these photos were taken, I've added eyes and washes to bring out the details on the bones). Also, note how "flat" or thin the figures are. This makes them a bit fragile and prone to bending and breaking. 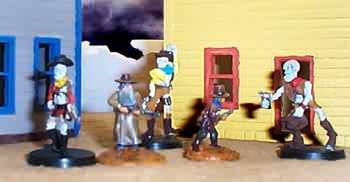 Note how the undead tower over my "true 25mm" Foundry cowboys. They are standing in front Arnica, Montana resin buildings. The marshal is a Deadlands figure by Jeff Valent. The grave digger is a 25mm figure that was sold for White Wolf's Mage RPG. This figure has been out of production for quite a while, but it often turns up in the "bargain bin" at game stores, so keep your eyes open for it. I was fortunate enough to find about five of them when a game store recently closed its doors.